Excel Add-Ins (.xlam) are powerful executable applications. Microsoft released an Office Security Update in 2016 to disable Excel Add-Ins files downloaded from the Internet by default. You need to enable the downloaded Excel Add-Ins files in order to use them. Find out how to enable Excel Add-Ins. Convert a full range of value from one measurement unit to another in a click. Unit Converter is an Excel Add-in designed to convert number values from one measurement unit to another unit quickly and easily. It is fast and easy to use and it runs on Excel on your own desktop. You may download the free complimentary version here, OR. Full range of commands show on "PPC" command tab. 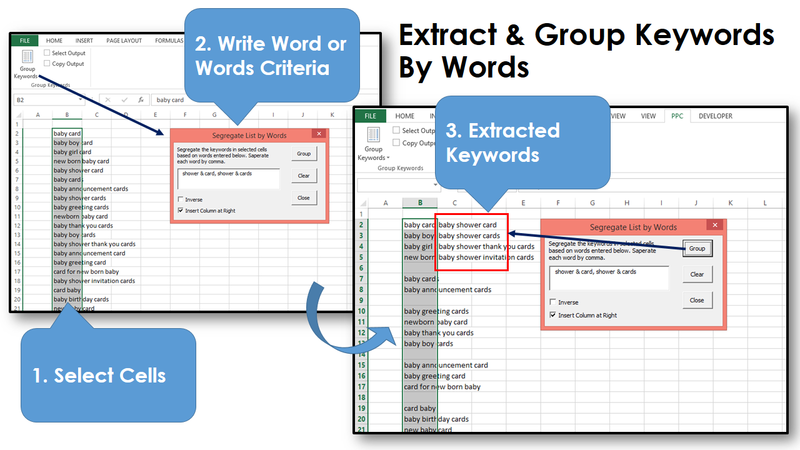 Keywords Editor is an Excel Add-in designed to edit, expand, group and compile keywords to a format for easy upload to Adwords. It is fast and easy to use and it runs on your own desktop. It processes, groups and compiles raw words in the selected cells to proper table with campaign name, Ad Group group and name, match types, Max CPC, URL and keywords status. This table format can be loaded to Adwords through Adwords Editor. It turns HOURS of MUNDANE WORKS into MINUTES. Links Editor is an Excel Add-in designed for online marketers to prepare links for web content or online marketing campaigns quickly and efficiently. It help user to tag, clean and edit links in bulk. It is fast, easy to use and it runs on your own desktop. You can tag many URLs of your campaigns in one click with different keywords or other different parameter values. You can remove or extract any part of a URL or a list of URLs, i.e. full web address, protocol, subdomain, domain, full hostname, port, path and page, utm parameters, non utm parameters, fragment (named anchor), in one click. It is powerful, watch our demos. You have options to encode or NOT to encode special characters in URLs. You can pick up parameter values in a URL and apply it on a list of URLs. It is a simple yet powerful time saver for your search engine marketing work. Don't waste your time on mundane works, let Excel VBA macro takes care of them. Keywords Editor's Adwords Wrapper use Excel Ribbon to control commands. Keywords Editor's Adwords Wrapper is an Excel Add-in designed to wrap keywords with match types for Adwords. It is fast, easy to use and it runs on your own desktop. It takes only a click or two for you to wrap the entire long list of keywords. It covers all scenarios of keywords match types wrapping situations that include broad match modifier. It can convert the "wrapped keywords" into a table format with header and proper match type descriptions that allows you to copy and paste to Google's Adwords Editor. Links Editor’s URLs builder is an Excel Add-in designed to tag URLs with Google Analytics tracking utm parameter value (i.e. utm_source=google, utm_medium=cpc, etc.) quickly and in bulk. You can tag many URLs of a campaign in a click. It is fast, easy to use and it runs on your own desktop.